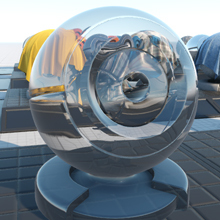 This section contains settings of the rendering post-processeses: refraction, motion blur, and volumetric shadows. 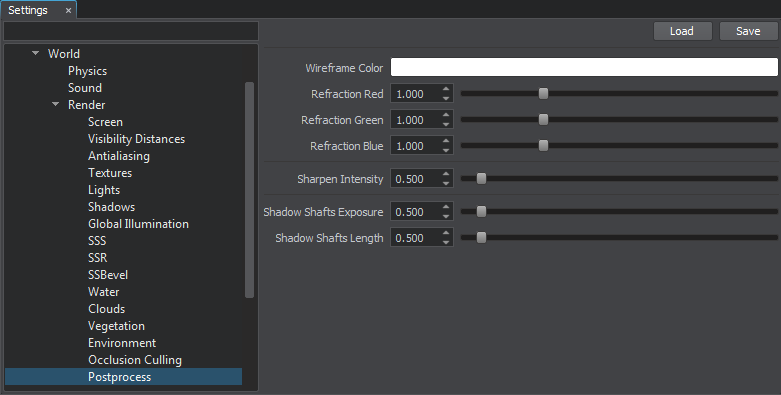 Color for meshes wireframes. The Show Triangles mode should be enabled: in the main menu, choose Rendering and click Show Triangles in the drop-down list. Refraction displacement for red channel (based on the refraction texture of refractive materials). It can be used to create light dispersion (chromatic aberrations). By the value of 0, there is no dispersion for refracted light in red channel. Refraction displacement for green channel (based on the refraction texture of refractive materials). It can be used to create light dispersion (chromatic aberrations). By the value of 0, there is no dispersion for refracted light in green channel. Refraction displacement for blue channel (based on the refraction texture of refractive materials). It can be used to create light dispersion (chromatic aberrations). By the value of 0, there is no dispersion for refracted light in blue channel.